One of my favorite things to do these days is paint galaxies. Not sure what I'm talking about? Check out the artwork that inspired me, by one of my favorite artists on Instagram, Jen Aranyi. I had all the tools on hand, so once I decided I wanted to make one myself, it was just a matter of doing it. After lots of trial and error, I've gotten the hang of it a bit more, and love messing around with different color combos. I thought I'd give you a quick photo tutorial in case you're interested in trying as well! I start off by taping my paper to whatever surface I'm using (in this case, a marble cheeseboard I got from Home Goods), leaving a small border where the tape is. I cut some 1" painter's tape in half to create these strips, which is a pain, but I found it works for me. Next I saturated the entire paper with water, using my brush, even getting my face nice and close to make sure there aren't dry spots because I cannot tell otherwise. Using a brush, I dropped droplets of color onto my paper. (You don't have to actually wait for it to drip, you can tap the paper with your brush.) 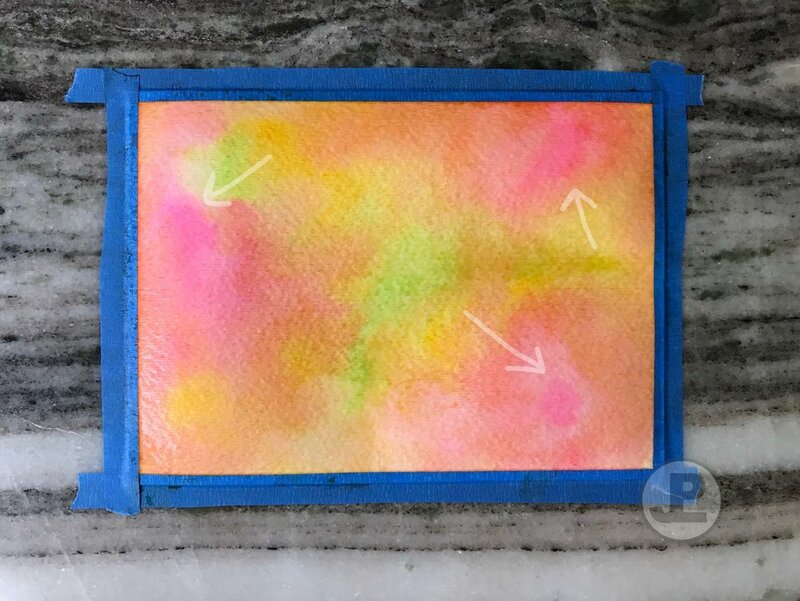 You can see the bleed and how each color spreads out in the picture below, which is what you're looking for to make sure your paper is wet enough. There's a photo example later of what happens when there's not enough water on the paper. Make sure to rinse your brush clean with water before dipping it in the next color. Once you've got your colors where you want them, take a clean brush and start swishing the colors around on the page. You can blend them over one another, around each other, whatever you feel like. Or try adding one color at a time, blending them in different areas, and see if you like that approach better. 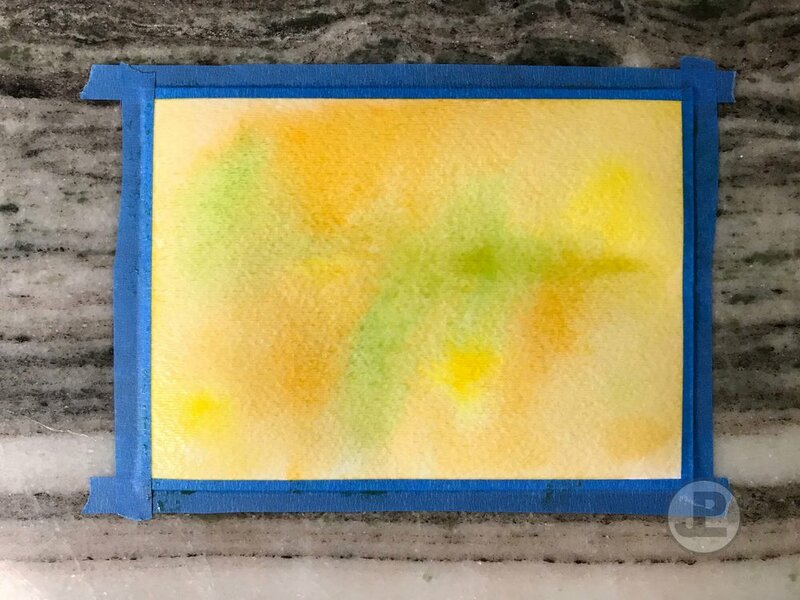 As you're creating, you can also add more color to saturate it in certain parts, or drop clean water on top and watch it run throughout the paint. The cool thing with this is you don't necessarily have to layer darker colors over light, once you tap the brush down to the paper, whatever's newest seems to just push the rest of the color out of the way. If there's too much water and you notice it dripping off the edges, gently sop it up with a paper towel. 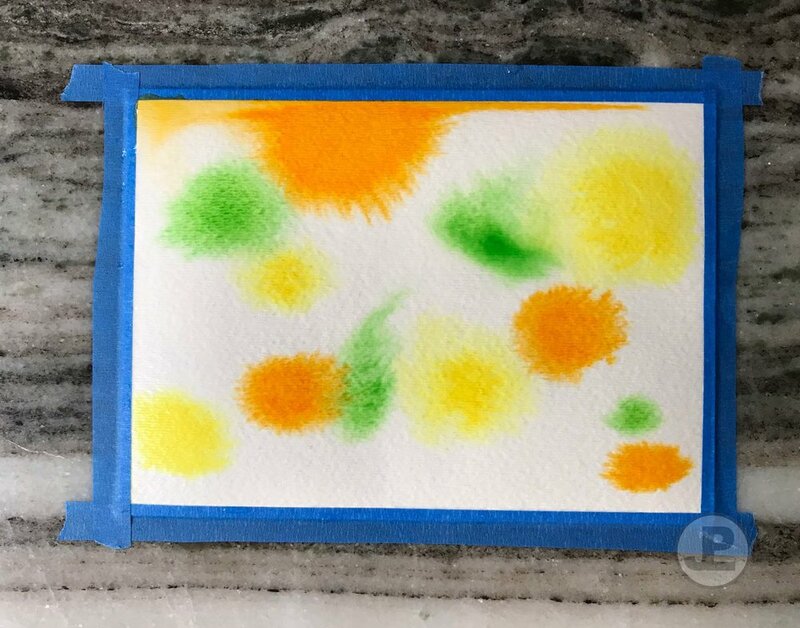 You can even blot the paper directly to create some different effects. At this point, I felt a little unenthusiastic about my color choices, so I decided to add in some pink. In this next picture you can see those darker pink spots, those were areas where I didn't add more water to the page before adding the color. It's not wrong, there is no wrong in this, it just won't blend completely in the end. Like I said, trial and error. You can create these with any colors you want, any saturation level you want, and at any size you want. I've discovered they make perfect backdrops for lettering or embossing, two other things I'm currently learning and practicing as well. As you can see, there are endless possibilities for color combos. Just one more thing to keep in mind, if you're making this and intending to frame it, is to measure your display area before painting. The background can be partially cut off by a matte without issue, but you wouldn't want your lettering or an image to be! An easy way to keep the border in tact is to tape it off there, instead of the small edge like I did. If you quarter a large sheet of paper, you'll get four pieces measuring 5.5" x 7.5," which is slightly too big for a 5"x7" frame, or even a 5"x7" matte. Just bear that in mind. Thanks for reading, and I hope you were inspired to try something new today. Did you test this out? I'd love to see what you came up with! Feel free to tag me on Instagram at @JessieMakesStuff or let me know in the comments.